RYRA (aka Rock Your Repaired Amp) is a small company based out of a workshop in Texas. We first became aware of RYRA main-man Shane Logan’s work via The Klone Pedal – Logan’s take on Bill Finnegan’s legendary Klon Centaur, which is rated by many in the know as a dead ringer for the real thing. It’s been a fixture of this writer’s own pedalboard for over a year now and has rarely been switched off. Building on the reputation of the Klone, Logan recently unveiled his versions of three other classic stompboxes. 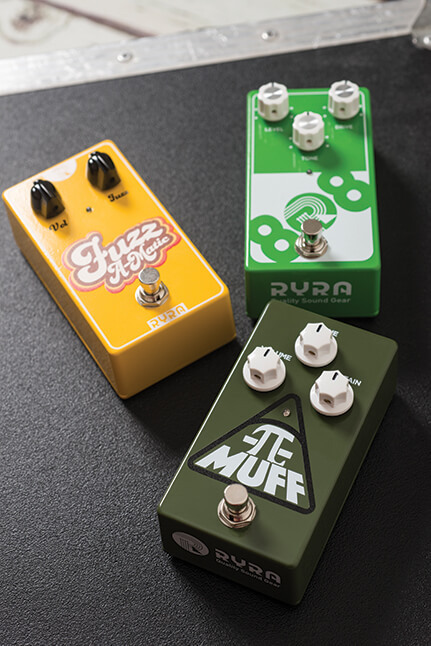 There are no prizes for guessing from where the 808, Fuzz A-Matic and Tri-Pi Muff take their inspiration, although despite its military paint job the Muff is based on the early ‘triangle’ iteration rather than later green Russian units. Each pedal is as robust on the outside as its internal wiring and PCB layout is neat. The 808 features the JRC4558D chip that many believe to be key to the sonic magic of original TS808 and early TS-9 units. The Fuzz A-Matic is equipped with NOS germanium transistors while the Muff’s fuzz is silicon in origin. All three stompboxes here are true-bypass so look elsewhere for a buffer. The top-mounted jack connections are worthy of note. This space-saving design means that, when plugged in, each of these RYRA units occupies approximately the same amount of width on your pedalboard as a mini-pedal with side-mounted jacks – good news for those who prefer a more compact board. Comparing the 808 to a modern Ibanez Tube Screamer Mini and a vintage TS808 proves interesting. 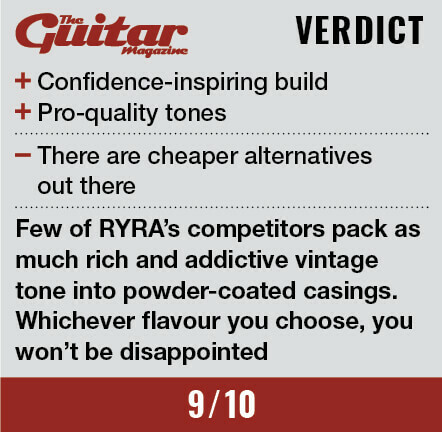 The RYRA is immediately warmer and clearer than the Mini, and although the £52 pedal is excellent for the money, it’s somewhat outgunned by this modern boutique interpretation. 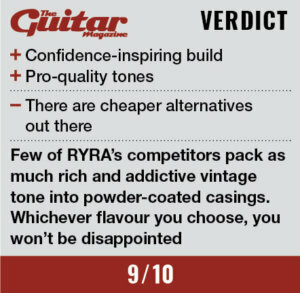 Next to the real McCoy, the RYRA 808 puts in an admirable performance – certainly close enough to allow you to retire your expensive original from stage use without missing it too much. The old TS808 has a little more grit and midrange complexity but with prices for a vintage unit now north of £500 – even exceeding £1,000 in some cases – all but the most diehard of tonehounds are priced out of the vintage game. We switch over to the Muff and wow… this is thick, rich, not too fizzy and more Black Keys than Smashing Pumpkins in its overall voicing. It’s deliciously textured and massively infectious. Unlikely to get lost in a mix, if only this pedal had been around when we were struggling with thin-sounding units in the late 1990s. It’s like swapping saccharine for molasses. Engaging the Fuzz A-Matic feels like stepping further back in time and predictably it’s less gainy than the Muff and more responsive to your guitar’s onboard controls. The noise level does jump up a fair bit, although that comes with the territory. Again it’s fat and gritty and musical, offering cranked-tweed and garage-psych tones with the fuzz control around noon, right through to Jimi when you crank it. Impressive stuff.